Powers/Abilities: Initially Miriam had low-level psychic abilities that enabled her to derive faint past impressions of objects which she touched. After the White Event, these powers increased greatly. She is now able to, while holding any objects, send her psychic self backwards in time to see significant events which have occurred in the past. While using her power, Playback sees transparent versions of the people and objects as the event happens. While in this form Playback is virtually undetectable to all beings except for Justice, who can see her due to his aura reading ability. Playback is extremely intelligent and perceptive. Peculiarities: Playback enjoys removing the air from tires on cars which are parked illegally in handicapped parking zones. Due to her diminutive size, Miriam must purchase her clothes from the Junior sections of department stores. (Justice#16 (fb) - BTS) - Miriam always possessed some degree of psychic ability, but that didn't seem to balance out the fact that she stopped growing at just over four feet of height. As a teenager she could never get a date. As an adult, people would look away from her on the street to keep from staring. After the White Event, Playback's powers became sufficient that the Chicago police began to use her in some of their investigations. One of her visions led the police to a child molester, who spent 18 months in prison. (Justice#16) - Playback was called in to investigate the death of the paranormal Lonnie Poole. After viewing his death, she was mortified when Poole's killer acknowledged her psychic self's presence. Playback was terrified by the Justice Killer and was too afraid to help create a composite sketch of him, especially when she saw him outside of her apartment window. While walking home, Playback was assaulted by the child molester she had previously helped arrest. She was saved when Justice appeared and incinerated her attacker. Justice helped her to her feet and told her that she must use her powers to do what she thinks is right. In response, Playback helped create a composite sketch of the Justice Killer for the authorities, which led to him being recognized by his daughter and former employer. (Justice#20) - Playback attended the Pitt Aid concert, where she ran into Justice, who assured her that he didn't mean her any harm, unless she wasn't using her powers properly. As Justice reached into his pocket to show her a symbol to see if she got any impressions off of it, Miriam thought he was going to use his sword hand on her, and she screamed. This attracted the attention of Seraph, who had made it his mission to protect paranormals. 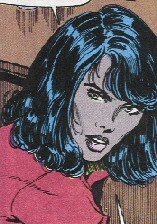 As Justice was distracted in detecting Seraph's presence, Playback fled from him, running into Terrence Updike, who convinced her to come work for the National Security Council, for her own protection. (Justice#22) - Playback was one of the NSC agents present as Updike discussed how they might apprehend Justice, who was suffering delusions and rampaging through the city. Her abilities enabled her to direct the others to Justice. (Justice#23) - Playback tried to explain to Justice that she gave him the creeps, but she was too intimidated to even get the words out. Updike's assistant, Chauncy stepped in and told Justice for her. (Justice#26) - Playback attended the funeral of another agent, Creeping Crud, during which she was talking to Chauncy, expressing her wishes not to be alone. Not long after, Justice interrupted a romantic encounter with Chauncy, making it clear he knew what was going on. On his request, she used her powers to help Justice try to track down the assassin, Quill, but she lost his trail when he took the subway. After expressing that she found that Justice had mellowed slightly and didn't make her skin crawl as much, they returned to the NSC HQ. (Justice#27) - Playback struck out trying to find another trail to Quill. (Justice#29) - Playback, Chauncy, and Shudderbug were sent to Coney Island to investigate stories of paranormals there. (Justice#30) - While they continued the search, Playback was abducted by Figurine. (Justice#31) - Playback was reunited with Chauncy and Shudderbug, when they, too, were captured by members of the Forsaken. Playback began to lose her cool, demanding that Shudderbug do something to help. He told a joke which calmed her, enabling her to take her mind off of the danger they were in. They were then brought before Judge Mental. (Justice#32) - As Judge Mental grilled his prisoners, Shudderbug repeated the joke, making Playback and Chauncy laugh once again. However, they all stopped laughing when Captain Brooklyn arrived to try to save them, and the Forsaken killed the hero. Shortly thereafter, Justice arrived and slew both Judge Mental and Seraph, and then took over the Forsaken himself. It is uncertain whether Miriam returned to DC with Chauncy or whether she stayed with the Forsaken (I'd guess the former). As far as I can understand, the New Universe moves with real time, and so events and dates are not to be considered topical. A lot of the detail in this profile comes from the one on page 27 of Justice#22.